EXCELLENCE: Debra Weitzner diabetic socks for men & women offer a combination of quality, comfort, and style. Made of 90% cotton, our socks are breathable, soft, and well-fitting, making it the perfect choice for you. 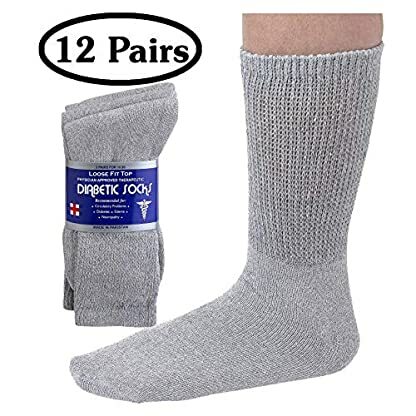 ENJOY MAXIMUM COMFORT: These non-binding socks feature a loose knit design that provides proper cushioning without squeezing or constricting your legs in any way. 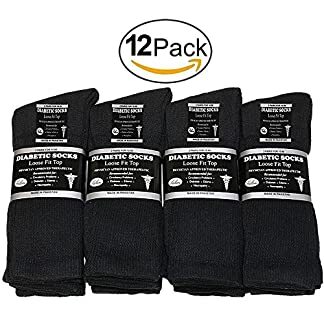 SUPPORT HEALTHY BLOOD CIRCULATION: These excellent mens womens diabetic socks are physician approved and highly recommended for people with diabetes, edema, and neuropathy caused by circulatory problems. Its loose fit top will allow your blood to flow unimpeded, boosting blood circulation. 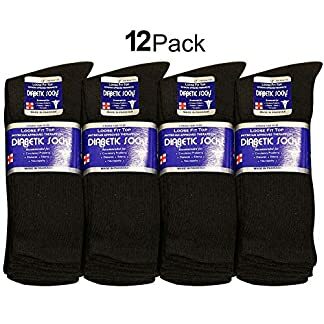 SIZES: This 12-pair pack is available in 3 sizes: 9-11 (standard women’s); 10-13 (standard men’s); 13-15 (larger than standard men’s). Size numbers indicate the amount of inches the foot measures from heel to toe, NOT THE SHOE SIZE. VARIETY OF COLORS AND STYLES: Although our diabetic socks are all about comfort, we kept your fashion interests in mind. Choose from the black, white, or grey options to suit your taste and style. 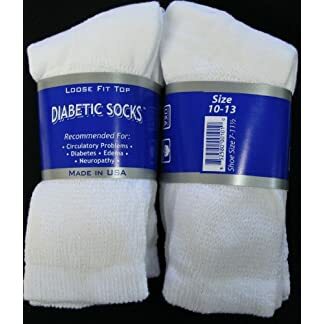 Each color is available in diabetic crew sock and diabetic ankle sock.